Just an hour-long direct flight from Seattle (or a pleasant four-hour drive), Kelowna is one of British Columbia’s top destinations for families. A favorite among those who love the outdoors, good food and even better wine, this lakeside city has everything to make a family vacation spectacular. Walk along sandy beaches, visit kid-friendly wineries and restaurants, and explore the nearly unlimited options for outdoor adventures. Whether you and your family are aiming to navigate the area on foot or by bike, Kelowna and its surrounding countryside offer plenty of paths and trails to choose from. If you’re hoping to explore Kelowna with your family, here are a few options to help make your outdoor adventures as kid-friendly as possible. Paul’s Tomb on Knox Mountain is an easy, 60-minute circuit that even hikers with the shortest legs will enjoy — including dogs, who are allowed on a leash. It also has a gradual incline, meaning your little ones won’t get tired out before they reach the trail’s end, where a secluded beach perfect for swimming and splashing in the lake awaits. For a quick, scenic walk with the family, try the Bear Creek trail. Or, for those looking for a longer trip, there’s always the Mission Creek Greenway: an almost ten-mile long trail system which spans from Okanagan Lake to Mission Creek Falls that offers a shady treetop canopy and flat terrain that’s perfect for bikes and strollers. Hop along to Kangaroo Creek Farm to be transported to another world altogether; the farm is home to kangaroo, wallabies and many more animals. Your little ones can even hold a joey! If you’re seeking a more iconic local activity, you can try your hand at one of Myra Canyon Adventure Park’s rope courses, which are located under the famous Myra Canyon trestles. Families looking to stay in the city should take the time to wander along the city’s waterfront boardwalk. The waterfront boardwalk trail connects to the Rotary Marshes wildlife park, where eagle-eyed visitors can spot herons, beavers and birds of prey. If you plan to spend the bulk of your time within city limits, we recommend staying downtown at either the Delta Grand Okanagan, the Prestige Beach House or the Royal Anne Hotel. Kelowna is located on the shores of one of the region’s most beautiful natural wonders: Okanagan Lake. The lake spans 84 miles and boasts more than 30 beaches to explore and relax on, many of which are family-friendly and include playgrounds and concessions. Whether you’re up for a five-mile morning jog or just running to get a hot dog from the concession stand, Hot Sands Beach — with its playground, waterpark, volleyball and basketball courts — is an excellent place to stretch your legs. Boyce-Gyro Beach is another ideal destination for families, as it offers a rope swing and a ton of prime picnic spots. To make a real splash, take the kids out to the floating Kelowna Wibit Water Park. And if you’re hoping to catch a glimpse of some kite surfers, Rotary Beach is the place to be. For families who choose to bring their own bikes and trikes with them on their trip, rooms at the Accent Inns or Hotel Zed are bike-friendly, and the accommodating staff will have plenty of recommendations for where to ride. If you don’t have your own bikes on hand, Myra Canyon Bicycle Rentals, Kettle Valley Railway Cycle Company or Kelowna E-Ride can equip the whole family for a day on the trails. Setting off on your own to explore is well and good, but booking a bike tour can give you a whole new perspective of the area. Plus, you’re sure to see something you wouldn’t be able to discover on your own. Giro Okanagan Cycling Adventures and Monashee Adventure Tours are both reputable companies that can customize a trip itinerary to your preferences. After you and the little ones have burnt off all that energy, it’s time to refuel. Restaurants 19 Okanagan Grill & Bar and Hotel Eldorado are especially family-friendly, offering kids menu items that even the pickiest of eaters will enjoy. 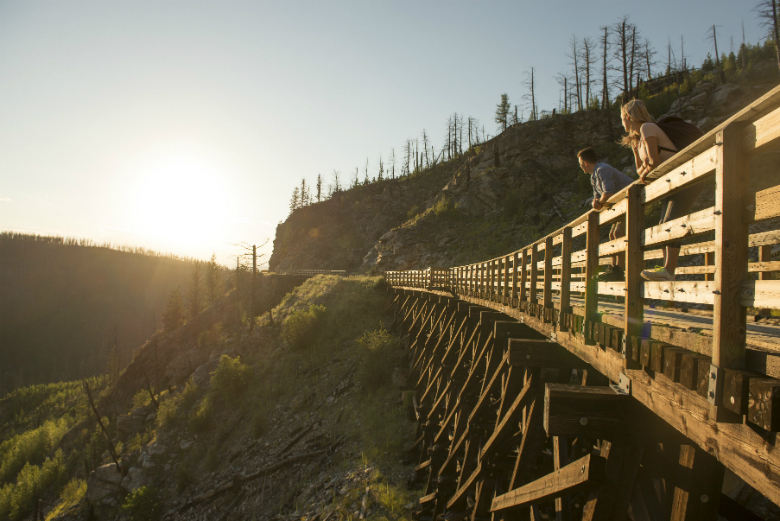 Whether you and your family choose to roam within the downtown core or hike the network of trails that surround the city, Kelowna is full of kid-friendly options for explorers on two legs and two (or three) wheels.